Ellington is characterized as an „African Stravinsky” who erased the color line between jazz and classical music. Stravinsky, a composer who was heavily inspired by Duke Ellington’s music and who’s music Ellington himself was an admirer of, frequently made use of jazz figures. He took jazz very seriously and went out, listened to it. When the ultramodern Russian composer visited New York in the 1950ties, the first thing he wanted to do was to chase up to Harlem and hear Duke Ellington’s magnifique jazz symphonies at the Cotton Club.„If music can be proved a neurotic influence then I´m certain you will find Stravinsky´s `The Rite of Spring` a great deal more exciting, emotionally, than a slow „rid“ arrangement of `Body and Soul` or even a fast rendition go `Tiger Rag´“ noticed Ellington. Stravinsky and Ellington were true to their own musical visions and both created new paths for all composers that have followed. They were assemblers who borrowed, incorporated and reharmonized music. And each relied on a close collaborator – Strayhorn for Ellington, Robert Craft for Stravinsky – to function as a composer. Most important, both were able to transform almost any available musical material through the power of an instantly recognizable style. Why Jazz Musicians Love ‚The Rite Of Spring’? The love for Stravinsky was often pronounced, especially during and following the bebop generation. It was only a matter of time until the challenging, pulsing „Rite“ was interpreted directly by jazz musicians. Charlie Parker is been documented quoting passages from „The Rite of Spring“ and other Stravinsky works multiple times. John Coltrane says he enjoyed listening to Stravinsky as a kid, even though it wasn’t anything like the other music he grew up with. A 100-year-old ballet, composed by a Russian for a French audience, has become something of a jazz standard. Igor Stravinsky’s orchestral score for „The Rite of Spring“ has been interpolated on record by musicians like Ornette Coleman. His „Sleep Talk“ also borrows from the famous opening bassoon melody of The Rite. And The Bad Plus, of course, did the whole thing with a visual backdrop in 2011. The Rite and jazz music at large can be seen as cousins. Roughly contemporaneous, both emerged in the 1910s, experienced their share of rejection and wound up among the most profoundly influential musical developments of the 20th century. If you look back into the past century, it seems that the different music styles have continuously been coming closer and closer to each other, no matter what their origins are. Jazz musicians have improvised on themes by Bach while classical composers have experimented with the pulsating rhythms of the Afro-American music. From the beginning on, both sides have been driven by the intention to seek renewal in their music or, in other words, driven by the obsession to be avant-garde. In BACK TO THE FUTURE terms such as composition and arrangement lose their distinctiveness while merging with each another. This is what leads to the question of originality and no longer of origin. 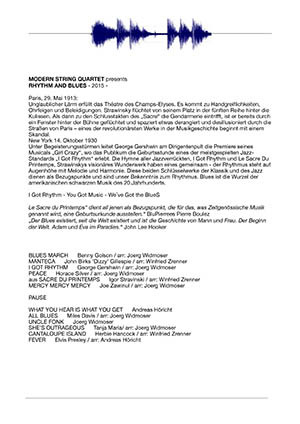 The creative intermingling of both music from the past and the present is nothing unusual for the MSQ. With their unique “tone” they create, at the same time, a new opus. 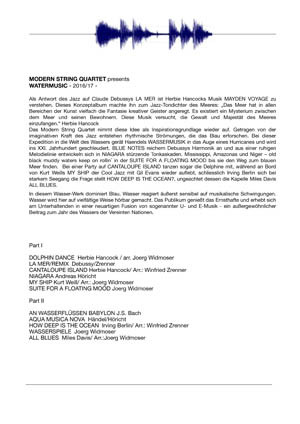 While this process culminates from time to time, elements from jazz, classical, minimal as well as ethno music are driven through a cosmos of rhythmic stringency at the speed of light. Ignition and lift off: BACK TO THE FUTURE is a trip into the past, the present and the future of music. And this music will arrive at where Duke Ellington had always wanted it to: at the right place, at the right time, with the right people. 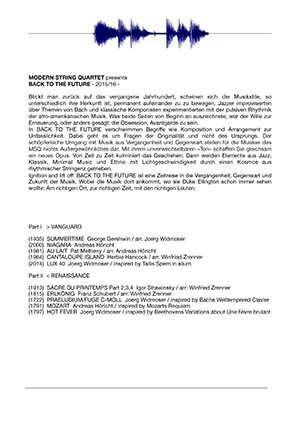 Joerg Widmoser, 1st violinist of the Modern String Quartet, has arranged the cycle of 24 preludes and fugues for string quartet creating the possibility of this tremendous work to be performed with this instrumentation for the first time in history. The preludes (originally using only 2 or 3 voices on the piano) were transformed to a four voice score to perfectly match the sound possibilities of a string quartet. Especially the polyphonic structure of Bach’s music becomes very clear with 4 instruments. 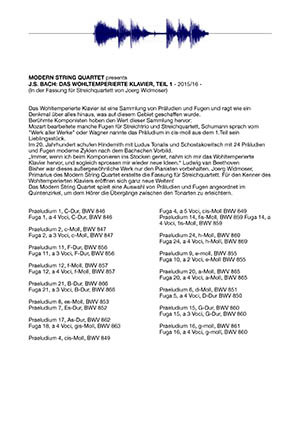 The polyphony appears effortless and natural, due to, after all, the prudent work of Widmoser, which took him 5 years: only in some preludes the musical structure and rhythmic allocation are changed to suit the sound of the string quartet.